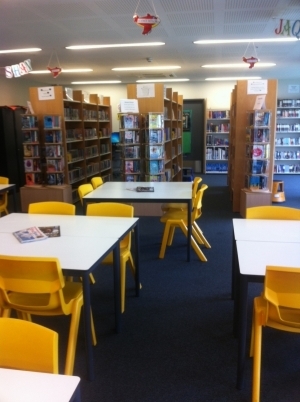 Haggerston School Library is located at the heart of the school and is much loved by students and staff. A dedicated team of student volunteers give their time to assist the librarian, Dr Parris, in the day to day running of book loans and regular activities. It is a thriving space where students from all years can get the support they need whether they are looking for an unputdownable novel, help with homework, or expand their knowledge beyond the curriculum. Our library opens each day from 8am to 4.15pm (plus a homework club running until 4.45pm Monday to Thursday) for students to access resources, get support from Dr Parris, and study quietly. Promoting literacy and reading for pleasure are key objectives for Haggerston School, and our library plays an important role by inspiring curiosity and a love of books. The library supports students through timetabled Library lessons, and all new students receive a prepared library induction. Students are allowed to borrow up to two books for two weeks at a time. The stock is updated regularly to support students from year seven through to sixth form. Students and staff are encouraged to share recommendations and offer suggestions for new purchases. To complement the full book shelves, Dr Parris is organising access to a number of online subscription resources to give students access to both up-to-date and archival research material, particularly useful for the Extended Project Qualification. We are developing stock for GCSE and A Level students, to assist in encouraging and developing attitudes to study that will benefit students at university, in the workplace, and beyond. If you are interested in supporting your child’s reading, research, or want to know more, please contact the librarian, Dr Parris, using the form on the Contact Us page.